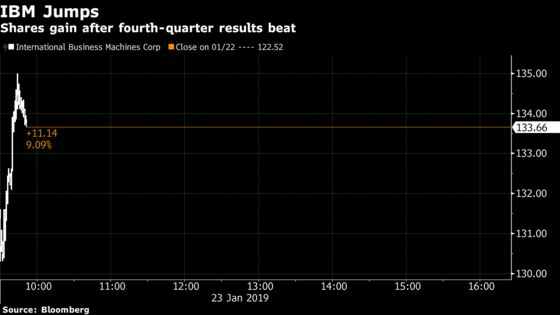 (Bloomberg) -- Shares of International Business Machines Corp. jumped as much as 10 percent, the most in a decade, after the company’s 2019 forecast and fourth quarter results beat analysts’ estimates. That was IBM’s “cleanest quarter in years,” Morgan Stanley analysts, including Katy Huberty, wrote in a note. Results showed a stronger-than-expected rebound for software after a weak third quarter, though Morgan Stanley sees slower software growth in the first quarter. IBM’s services “transformation” is also “bearing fruit,” Huberty wrote, as total services revenue grew 2 percent. Shares rose 9% to $133.57 at 9:54 a.m. in New York, as the S&P 500 rose less than 1 percent. Morgan Stanley is raising estimates for this year’s earnings-per-share due to better-than-anticipated organic software and services revenue growth and operating leverage, along with a gain-on-sale of assets that made up for lost profit and additional restructuring costs. There’s more good news as well, as IBM’s results confirm feedback from a recent Morgan Stanley CIO survey signaling “strength in software, analytics and services focused on hybrid cloud and digital strategy.” CIOs had ranked cloud computing, digital transformation, and BI/analytics as their top three priorities. “IBM’s transformation has been slower than anticipated, but we see the company accelerating the pivot to growth as CIO priorities align with investments in Strategic Imperatives and combine with divestitures of non-core businesses,” Morgan Stanley said.